In my last post, I showed how new development can help us meet our environmental sustainability goals, including the county’s commitment to eliminate greenhouse gas emissions entirely by 2035 and reduce stormwater runoff into the Chesapeake Bay. I also have discussed (here, here and here) the ways in which New Suburbanism adds needed housing while satisfying consumer demand for walkable urban places, even in areas that aren’t transit-oriented or adjacent to existing urban centers like Silver Spring and Bethesda. Now I want to direct your attention to a related problem: While we know that we need to add more than 20,000 housing units over the next five years to accommodate additional job growth, we don’t have much undeveloped land that is suitable for new residential construction. A few years ago, the Planning Department conducted an exhaustive review of the county’s land area by parcel and identified the constraints that restrict development. 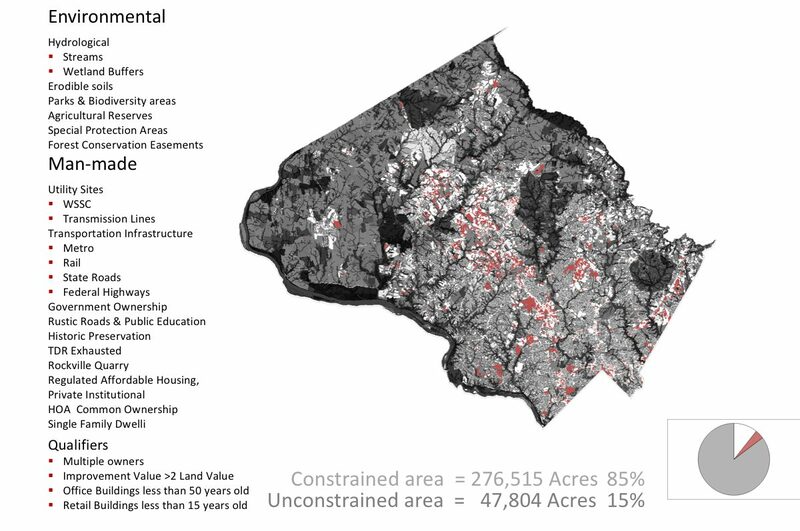 The results of this analysis illustrate that in a county with about 1 million people and a mature land use pattern, relatively few properties are entirely unconstrained by legal, physical or economic barriers to development. In turn, these limitations make it difficult to accommodate our growing population, contribute to high housing costs and risk pushing development farther from job and activity centers, exacerbating traffic and environmental problems. Montgomery County is more than 500 square miles in size or about 324,000 acres. At 93,000 acres, our award-winning Agricultural Reserve, where development rights are extremely limited, comprises almost a third of that land area, constraining new building even more. Sensitive natural environments, requiring conservation and protections, also limit development. They include wetlands, stream buffers, forest conservation easements and, of course, parks. Including the Agricultural Reserve, the total area affected by these environmental restrictions is almost 250,000 acres – leaving only about 75,000 acres. 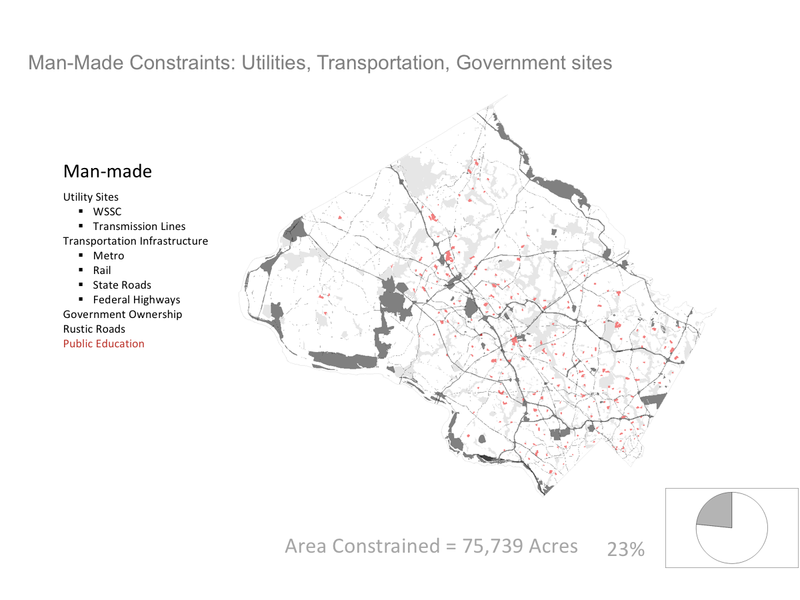 Much of the county’s land area is also subject to man-made constraints imposed by both public and private entities. In the series of images below, man-made constraints are represented in gray and red. In the first image in the series above, we see that utilities and transportation infrastructure, including power lines, roads, Metrorail and railroad lines, take up about 14,000 acres. Another 60,000 acres are owned by the government, including sites for government offices and warehouses as well as public schools and parkland (public school sites are in red). 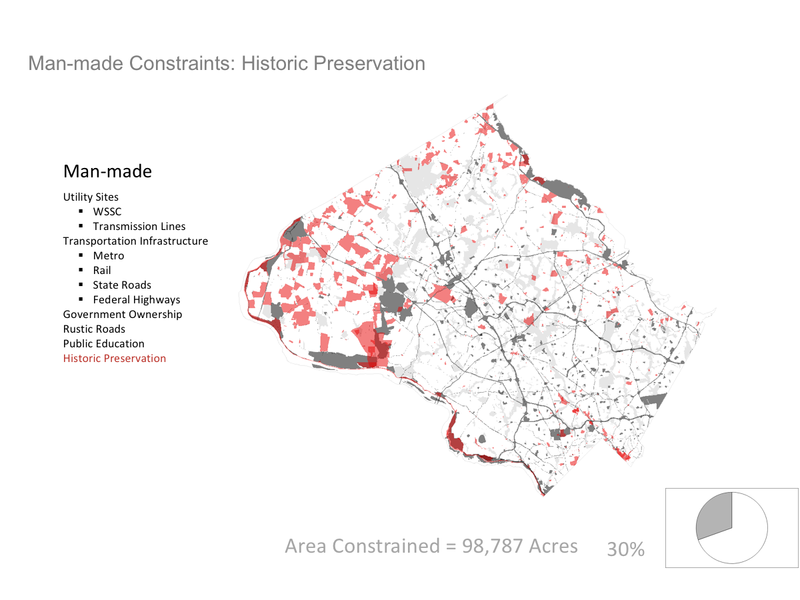 The second image shows that another 20,000 acres are protected by historic preservation designation (in red), bringing the total area subject to these man-made constraints to almost 99,000 acres. As with government-owned property, some of this area is parkland and is therefore also counted as an environmental constraint. Moving to the next image, roughly another 6,000 acres consists of played-out rock quarries and transferable development rights that limit development in agricultural zones. Regulated affordable housing (which unlike market-rate affordable housing is unlikely to be redeveloped), private institutional uses (like schools and religious institutions) and property under common homeowner association (HOA) ownership add up to about another 6,000 acres (these categories are all in red on the map). At this point, the total acreage of land under one form or another of regulatory or physical constraint totals about 111,000 acres or more than a third of the county’s total area. Another 90,000 acres in Montgomery County are zoned for single-family housing. Some minor intensification can occur in these neighborhoods – primarily in the form of townhomes. But absent regulatory changes that make it easier to build townhomes, duplexes and small apartment buildings, most of these neighborhoods will never see much additional housing. The fourth and final image in the series above demonstrates that with the inclusion of single-family zoned neighborhoods, the total land area under a man-made development constraint comes to 201,000 acres, or 62 percent of the county’s total land mass. As I pointed out earlier, environmental and man-made constraints do overlap somewhat – for example, parks can be considered both an environmental and a man-made constraint on development. Another example of this overlap can be seen in single-family housing and roads in the Agricultural Reserve. 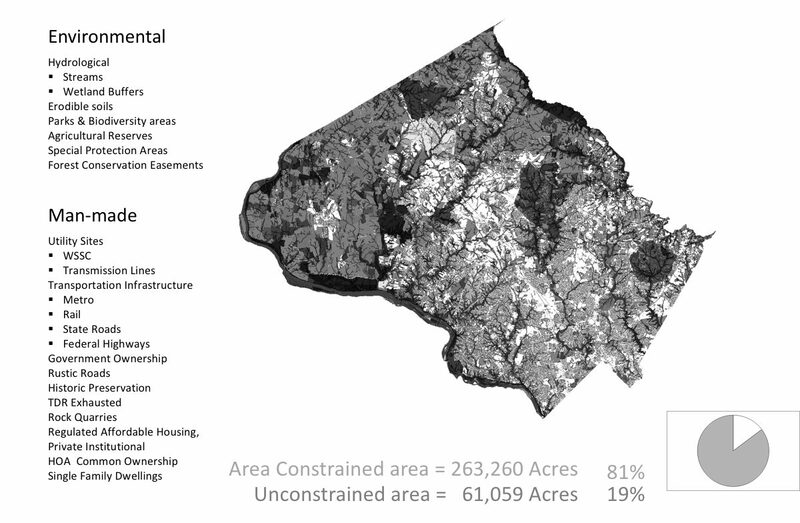 However, once we account for these areas of overlap, our research shows that 81 percent of the county is under a constraint, leaving only 62,000 acres – or 19 percent of the county – available for development. The value of existing improvements is at least twice the value of land. An office building on the site is less than 50 years old. An existing retail building is less than 15 years old. A parcel is owned by multiple parties. 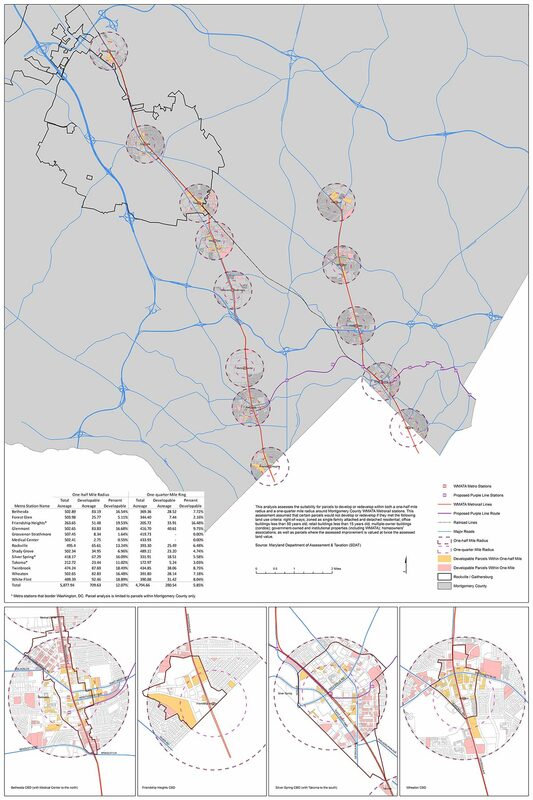 This analysis is somewhat oversimplified and is not meant to predict with certainty whether any particular parcel will be redeveloped, but it provides a useful filter for understanding how much land that might be available could plausibly be expected to support new development activity. If any of the first three factors are present, the expected rate of return is unlikely to be high enough to offset the cost and risk of redevelopment or, in many cases, even allow the developer to obtain financing. With the last factor, the practical difficulties of getting multiple property owners – some of whom may rely on a steady cash flow from an investment property – to take on the financial risks of redevelopment are often impossible to overcome (as the county’s experience with the Glenmont shopping center has shown). Once these additional qualifiers are added to the analysis, only about 15 percent of the county’s land is available for development. 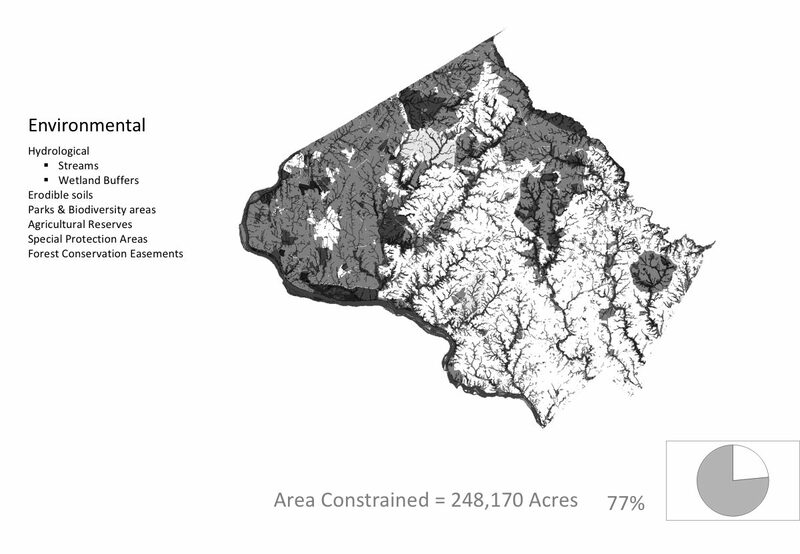 Of course, 48,000 acres is a lot of land, but much of this acreage is not necessarily optimal for redevelopment. 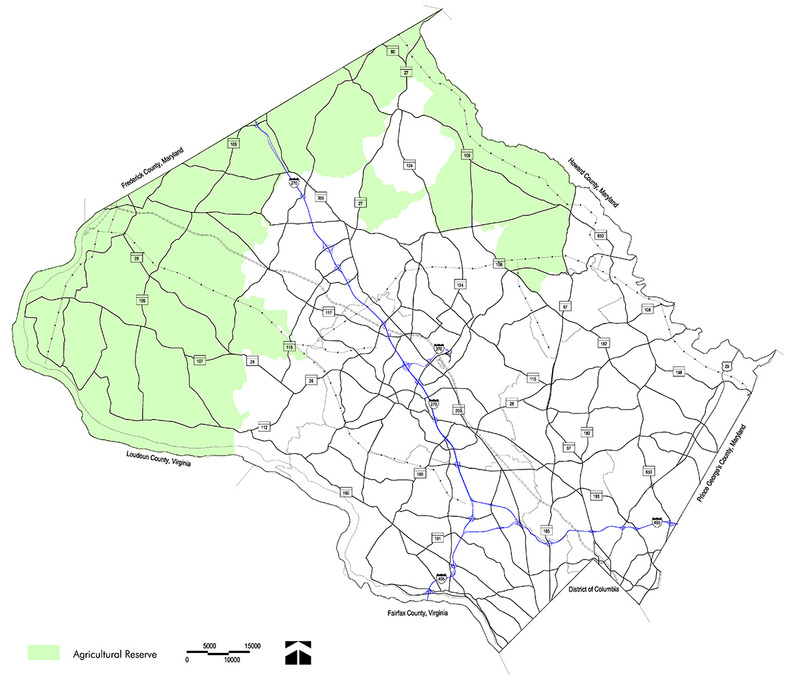 For environmental, economic and social reasons, Montgomery County’s “Wedges and Corridors” General Plan, adopted in 1969 and still guiding our land use planning, prioritizes development in the urban ring and along our major transportation corridors. The location of the remaining 15 percent of the county’s developable land isn’t concentrated in any one area and certainly not in our urban centers. 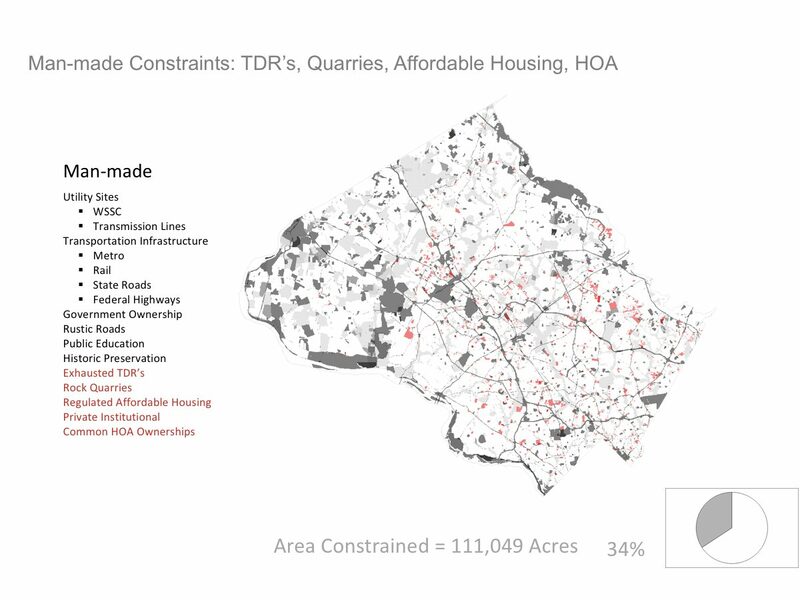 Take a look at this more tightly focused constraints analysis, showing developable parcels within ½ and ¼ mile of each of the county’s 13 Metrorail stations. 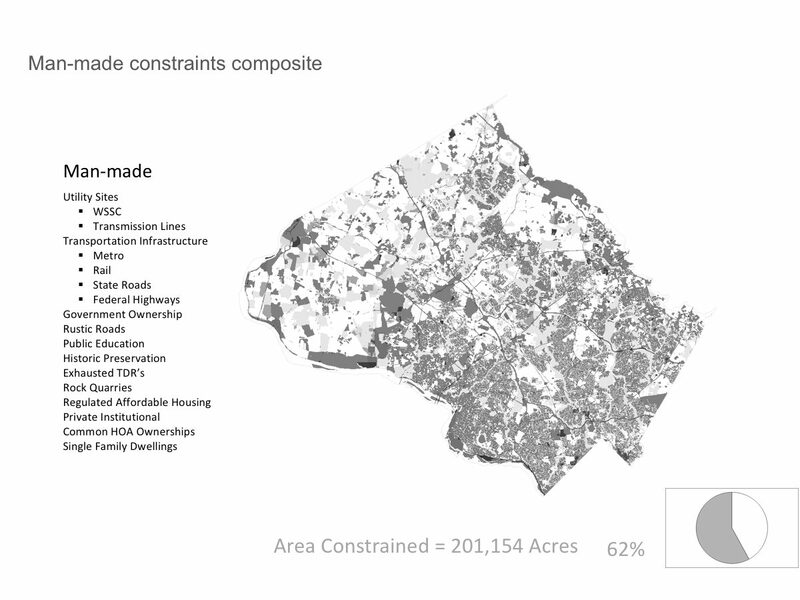 This analysis shows that a little more than 700 acres of land might reasonably be expected to be available for redevelopment within ½ acre of a Metro station in Montgomery County and less than half that amount within ¼ mile of a Metro station. Yet, if you look at the map of average vehicle miles traveled per household included in my last post, you’ll see that there are compelling reasons to focus new housing and office development in transit-accessible areas. Given concerns about traffic and carbon emissions, we should make it possible for many more people to live and work near transit. Maximizing the development potential near transit is only one half of the equation: even accounting for increased heights and densities permitted in plans like the recent one for downtown Bethesda, 700 or so acres of land within ½ mile of a Metro station do not provide enough capacity to accommodate the increasing demand for housing in Montgomery County. To ensure that growth occurs close to job centers and other amenities, and demand for walkable, mixed-use communities is satisfied, we also need to take advantage of redevelopment opportunities that transform aging, low-density, surface-parked properties in desirable locations into communities like Pike & Rose, Park Potomac and Chevy Chase Lake (now under construction). This two-pronged strategy – concentrating infill redevelopment near transit areas and in strategically located mixed-use redevelopment projects – is the only way we can continue to protect the Agricultural Reserve and prevent sprawl while accommodating the county’s growing population. Infill redevelopment helps us meet our housing needs so we can avoid exacerbating high housing costs and pushing lower and middle-income residents farther from jobs and amenities or out of Montgomery County altogether. If we can’t find a way to make room for all our residents – current and future taxpayers and neighbors – we risk sacrificing our county’s diversity, character, environmental sustainability and economic vitality. So the conclusion is that future growth needs to rationed to balance capabilities of the county and property owners desire for unlimited growth. County government needs to know how much beyond a million residents we can go without turning the county into something very undesirable. To help congested areas, we need to do a much better job at creating urban parks. Trees, water, views and open air are what makes good urban parks. You look at the Pike and there is not one nice park for the new towers on that road. Planning needs to really demand more space and back away from urbanization in the extreme. One thing which can be done is the removal of the Montgomery Co School bus lot on Crabbs Branch Way. This is prime property near the metro and needs to be developed as per the approved county plan!! It is an eyesore and an environmental problem. Too much pollution in one small concentrated area!